This card uses Stampin' Up! 's hostess stamp set, Bloom with Hope, and the new alcohol-based Blendability markers. 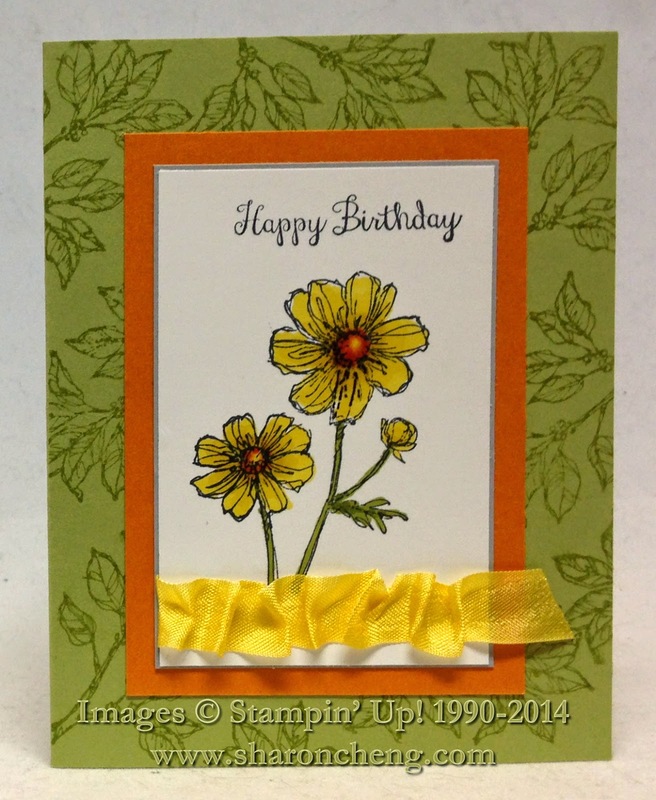 Bloom with Hope (133952 $17) is one of the most versatile stamp sets in Stampin' Up! 's new 2014 - 2015 catalog. I decided to make this card to fit two of Splitcoaststampers' weekly challenges. The first challenge was to try a technique that is new to you. As a Stampin' Up! demonstrator, I've used water-based ink to color my images. This was one of my first tries with Stampin' Up! 's new Blendability markers. They make it easy to blend and are great fun! Notice the ruffled or ruched ribbon across the bottom? The second challenge was to use a rumpled item on the card. Here is one of my IAM (In A Minute) tutorials on how to easily ruffle ribbon. This series of videos is designed to share quick tips and techniques that I've taught throughout the years in my classes. While I've put some tips in my project videos, you have to remember which project included the information you want. That problem inspired me to make these IAM Tutorials. Let me know what you think about these IAM Tutorials and what tips you would like me to share in future videos.